McAllen Memorial's Sean Skaugen competes in the 110 meter hurdles during a District 30-6A track meet at McAllen Veterans Memorial Stadium on Thursday, April 5, 2018, in McAllen. 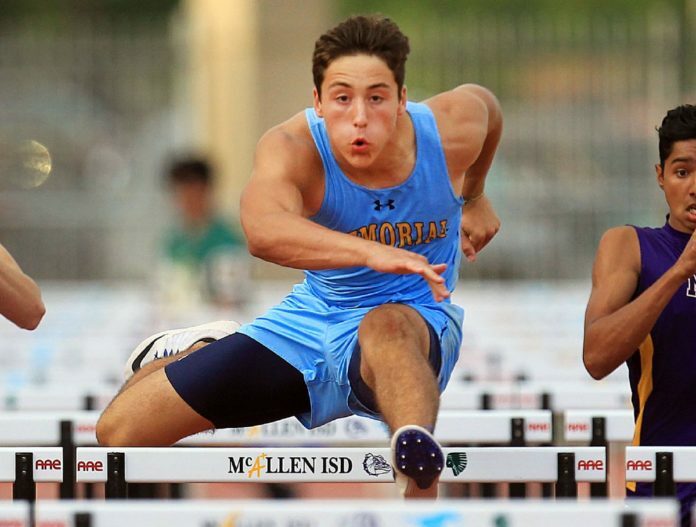 McALLEN — This race weekend feels like a long time coming for McAllen Memorial junior Sean Skaugen. During practice at Boxer Hernandez Stadium, Skaugen is an imposing figure. He’s almost reached 6-foot-3, and his upper-body strength is visible. According to Skaugen, that’s why his season has been so successful. Being healthy in the postseason helps, too. He’ll line up at the Region IV-6A meet today and Saturday at San Antonio’s Alamo Stadium hoping to leave as a state qualifier.